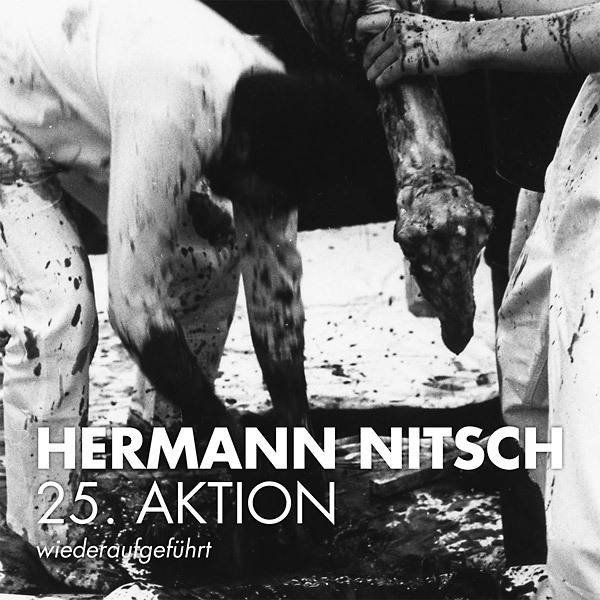 Hermann Nitsch is an Austrian painter, composer, and performance artist. Among his most notable projects is the Orgien Mysterien Theater (“Theater of Orgies and Mysteries”). Staged from 1962 until the present, this is a series of over 100 performances, or “aktions” as Nitsch calls them, that dramatize mass human gatherings centered around violence. The performances, sometimes lasting for days at a time, display scenes of extreme brutality – crucifixions, disemboweled animals with their entrails splayed, buckets of blood poured over bodies or splattered on the ground – and extreme decadence, with flowing wine, lavish spreads of fruits and meats, and ecstatic music and dancing. Nitsch describes the aktionen as his attempt to capture both “the tragic aspect of suffering and instants of extreme ecstasy” that make up our lives. (See one here). This LP is a remastered tape recording of 25 Aktion performed at Gallery Pakesch in Vienna in 1982 (a restaging, the original performance was in 1968). The recording opens with piercing whistles, leading into a wild chorus of dissonant horns (T1/A1, T2/A2, T3/B1). While listening, the first thing that came to my mind was the nonstop drone of a stadium-full of vuvuzelas during a football game (our own modern version of the violent spectacle?). Drumming, followed by human voices, join in; first, the sounds are lost in the fray, but later the chaos is organized into a chant (T2/A2). The final track is the aftermath of the ceremony, scored with solemn, droning organ chords (T4/B2). Naysayer suggests we create an aktion at the station – maybe for our next Listener Appreciation Party?